Yangon, dubbed Rangoon by the British, is the capital of Myanmar. This is a lush, green, tropical city with countless gardens, parks, and lakes. 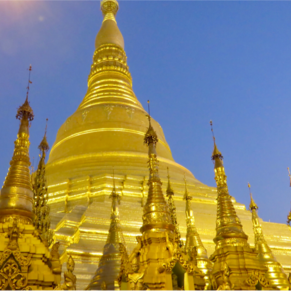 The most famous landmark is the Shwe Dagon Pagoda. Towering over 300 feet and built on a hilltop, this fabulous cone-shaped structure is covered in gold. 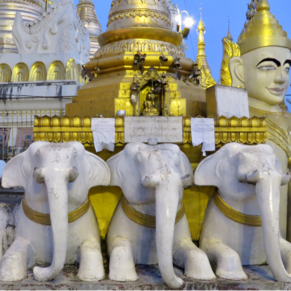 A truly cosmopolitan city, Yangon offers many fine restaurants and plenty of shopping. Arrived late here so tours had to be rearranged. Started with a visit to Swedagon Pagoda at night. Impressive. The next morning we took an all day tour to Bago . On the way we stopped at the WWII cemetery which is beautifully maintained and very moving. We visited a monastery, had a good lunch and saw the Shwethalyauhg Reclining Buddha. Local women wear a yellow paste on their cheeks for sun protection. Drove through a sudden and very strong hailstorm on the way back. The driver had to pull over and stop because he couldn’t see. The next mowe visited a fascinating local market. Not to be missed. Oceania’s ms Nautica spent three days here in April 2016. 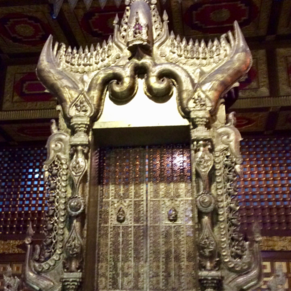 First day: full-day tour of Yangon city, visiting a number of religious shrines, museums, and markets. Horrendous traffic—first Sunday of major holiday shopping season. 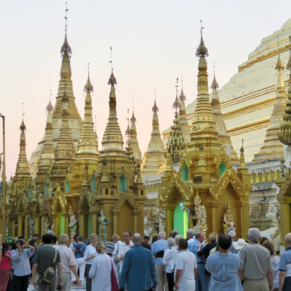 Tour ends with sunset visit to spectacular Schwaedagon Pagoda—a major highlight of the entire 18-day cruise. Second and third days: overnight visit to the temples of Bagan (see next day’s entry). ¨This place was 3rd world insofar as the infrastructure and the general cleanliness of the streets. This was our longest stay in any of the ports and it was the worst. The only good thing was the Shwedagon Pagoda, this was simply stunning and worth the stop to see this. Other than that, move along please nothing more to see. It also took 90 minutes from the ship to the city on a very ordinary road. There are currently 0 discussions about Yangon (Rangoon), Myanmar.